Stuck mouthpieces are the easiest to fix so let's talk about those first. Mouthpieces are easy to get stuck because the mouthpiece shank is conical — it goes from narrow to wider. When the mouthpiece is placed in the trumpet it should slide in until it fits snugly; at that point it won't leak air and it shouldn't fall out. But if it gets bumped in further, it often gets wedged and won't come out. And with the mouthpiece stuck in the receiver the trumpet won't fit in its case. Pliers and vice grips are exactly the wrong tools to remove it, as trumpet brass is soft and bends easily. The technician (and sometimes the band director) has a special tool for pulling stuck mouthpieces; with the right tool it takes only a couple of minutes — and nothing and nobody gets hurt. Sluggish valves are a real nuisance because they don't keep up with the player; playing is hard enough without fighting your instrument. Sluggish valves have two common causes: there is dirt or something foreign in them, or the piston or its casing is bent out of shape. You can usually tell which it is by how consistent the problem is — if the valve sticks every time it's played, something is bent; if the valve sticks intermittently, it's dirt or some impurity in the valve. If thorough cleaning doesn't fix a sticking valve, either the piston or the casing is bent and a technician will need to straighten it. The tolerance between the piston and its casing is very small. A small dent in the casing or a slide bent slightly into the casing will drag the piston. The technician has special tools to remove dents while maintaining the close tolerances necessary for the trumpet to play easily. Stuck slides are sometimes the result of an accident or bump, but usually they're caused by the chemical bonding of impurities left on them. Sometimes they'll come apart with a little pressure — but not pressure applied with a hammer or pliers. The technician will likely try a soft belt and gentle tugs first. If that doesn't work, he'll probably apply heat. And if that doesn't do it, he'll have to disassemble the trumpet at its solder joints, attach something sturdy to the slide tubes, and apply enough heat and pressure to separate them; then he'll solder the trumpet back together. It sounds complicated (and it is) but if the technician is experienced, the trumpet should look fine. 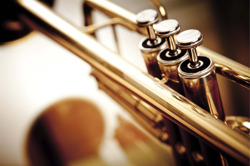 Broken solder joints happen when a trumpet is dropped or twisted. The technician straightens whatever is bent, thoroughly cleans both sides of the joint, and fits the parts back into place. Using a gas torch, he heats the joint to melt the solder without burning the lacquer finish, carefully flowing the solder across the whole joint. When the solder cools he cleans around it, and it's good as new. Dents are where the true artistry of a good technician shines through. Using special mandrels and other burnishing tools the technician smoothes out the dent. Sometimes when the trumpet's lacquer or plated finish wasn't damaged in the accident, you have to look closely to see where the dent was. There's little damage to a trumpet that can't be fixed, and when it is, the trumpet should play like it did when it was new. Why Let Amro Repair Your Trumpet? 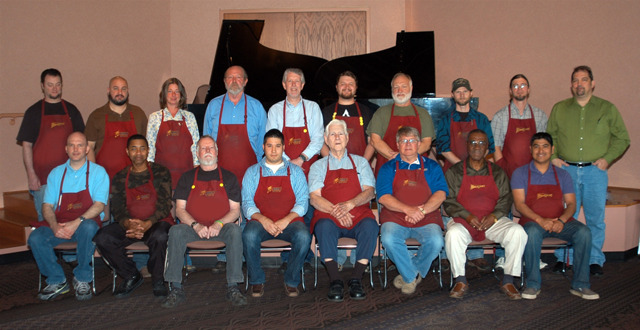 The Amro repair shop fixes more than a thousand trumpets each year for trumpet students, hobbyists, and professional trumpet players. 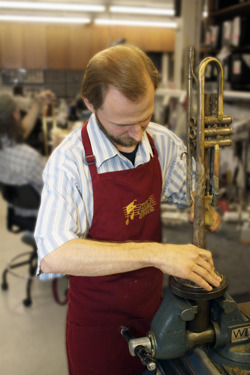 An Amro technician will be happy to play-test your trumpet, talk to you about what it needs, and quote a price to restore it to good playing condition. Usually they can complete your repairs in a day or two. Technicians are available in-store so you can talk to them directly and describe the problem. Bring your trumpet by and we'll check it for you. Ask about Amro's Maintenance & Replacement Plan. Do you have questions for our repair shop experts? Give them a call at (901) 323-8888 or send them a message here.